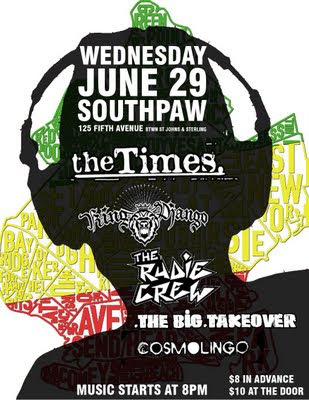 NYC Ska/Reggae Gig Alert: King Django, The Rudie Crew, The Times, The Big Takeover, and Cosmolingo Tonite! King Hammond Conquers America with his "Bongo Ska Fever"
Below are some of the fruits of King Hammond's labor from his recent trip to Long Beach, San Diego, and Tijuana (as documented by Paul Willo, ace video maker, author of "You're Wondering Now: A History of The Specials," and co-administrator of The Specials Fan Site), set to KH's tune "Bongo Ska Fever" (off of Jacuzzi). 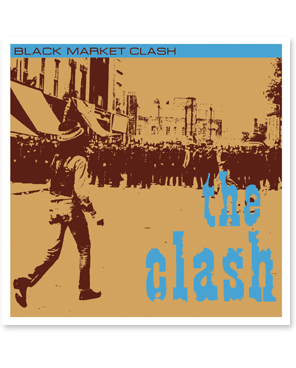 Since most of the ska fans that I know love and revere The Clash (indeed, many people's first forays into ska and reggae were made through The Clash), I thought it was worth mentioning here that Drastic Plastic (a vinyl re-issue label based in Omaha, Nebraska) is re-pressing Black Market Clash on 10" vinyl (limited to 5,000 copies). This is the first time this vital collection of singles and B sides has been pressed in this format since its debut in 1980--and it contains some crucial reggae cuts like their original "Bankrobber/Robber Dub," a cover of Willie William's "Armagideon Time" and its dub versions "Justice Tonight/Kick it Over," and a revved-up ska reading of Toots Hibbert's "Pressure Drop." Drastic Plastic has also re-issued The Clash (UK version) and Give 'Em Enough Rope on vinyl, as well as The Ramones' first four albums (plus the Rock 'n' Roll High School soundtrack), The Undertones' debut, and The Toasters' 25th Anniversary compilation. 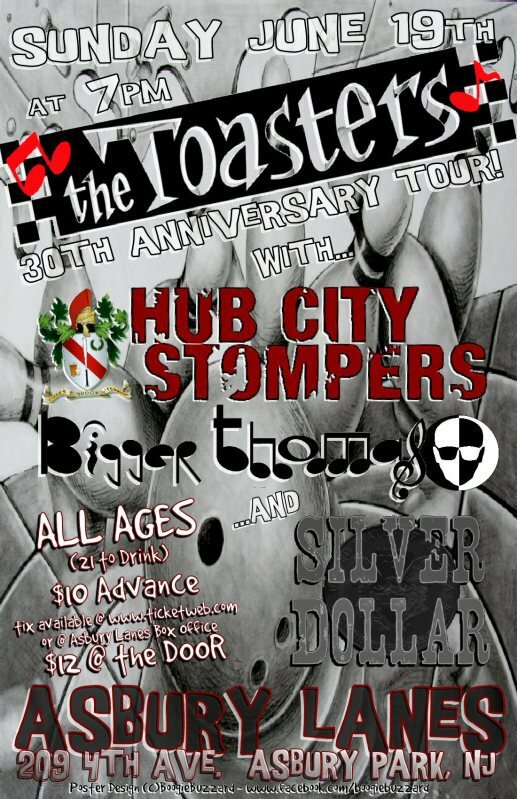 NJ Ska Gig Alert: The Toasters, Bigger Thomas, Hub City Stompers, Silver Dollar Tonite! Happy Father's Day from the Beastie Boys and Santogold! Major Lazer has remixed the extraordinary Santogold/Beastie Boys collaboration "Don't Play No Game That I Can't Win" (listen to it below), which will also be released as a vinyl single (through Mad Decent) on July 19, 2011. 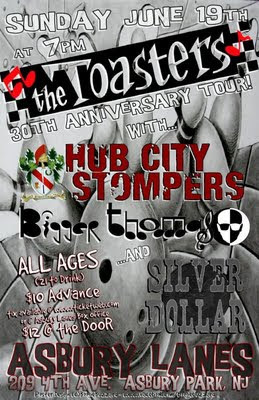 NJ Ska Gig Alert: Bigger Thomas and Hub City Stompers Tonite! Duff Gig Review: The Toasters' Rocks Off Booze Cruise (6/12/11)! Even though the weather was kind of cool for NYC in June (as well as overcast), it was still fantastic to be out on the waters around Manhattan--and be reminded that I actually live on an island--to take in a great night of ska with The Toasters on the Rocks Off booze cruise. About 200 people boarded The Jewel (hey, it was a Sunday night--plus there had been three other ska/reggae shows in NYC that weekend) at 23rd Street and the FDR Drive for the three-hour SS Minnow tour that took us under several of the big East River bridges (Williamsburg, Manhattan, and Brooklyn for you tourists), then around the southern tip of Manhattan (the Freedom Tower is really starting to rise quickly--which is good, since lower Manhattan needs some sort of landmark building; there's been a gaping wound in the skyline for far too long). We also cruised up pretty close to the Statue of Liberty and Ellis Island (one of my good friends on the cruise had four immigrant ancestors pass through there on their way to America--and here we were, a boatload of their great-great grandsons and daughters, sailing the same waters purely for fun; some powerful stuff to ponder over a beer or two). While we didn't actually see Royal City Riot perform, we heard them pumped through the speakers on the top deck and they sounded pretty damn good. RCR opened their set with a decent cover of "Gangsters," which somehow seemed pretty ballsy. Gotta focus more on them next time. The Toasters put on their usual terrific set, though their sound was significantly augmented by the extraordinary Dave Barry on keys (who was on the road with them for this mini-tour) and Sledge (who was sitting in with them for the night--Buck cajoled him to come in from the wilds of New Jersey for the gig). No disrespect to the current members of the band, but I gotta say that Dave and Sledge really help flesh out The Toasters' signature sound. Earlier in the evening, I spoke to Buck regarding when the "House of Soul" vinyl single is going to be released. Buck told me that it had been recorded a while back, but since that time the song has evolved a bit on the road and he's thinking about re-recording it when he's back in Spain. So, the release will be pushed back until later in the summer...but it is coming. I also tried to extract a bit more info from him about the planned Toasters 30th Anniversary show in NYC in October, which will feature many former and beloved members of the band. While Buck named several ex-Toasters from various incarnations of the band who might be there, nothing is locked in yet, but there are sure to be some big surprises. The next ska booze cruise will feature The Pietasters on July 29, 2011. 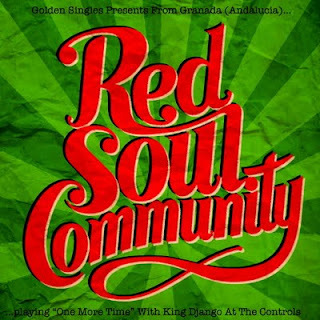 Duff Review: Red Soul Community "One More Time" b/w Green Room Rockers "I'd Rather Go Blind"
It was definitely an inspired idea to pair up two of the best ska-reggae-soul acts on the scene, Green Room Rockers (USA) and Red Soul Community (Andulasia), for a split single. But what's even more brilliant--and I'm not even sure this was intentional--is that one side is the answer song to the other; they're two sides of the same coin. On "One More Time" (an alternate mix of an album track, nicely produced by King Django), Red Soul Community's Isabel Garcia sings about the difficulty of ending a romantic relationship ("One more time/I gotta say goodbye/but for the first time/leaving is too hard"). Even though she knows this is something she's gotta to do, she unexpectedly finds herself adrift: "I'm a tourist everywhere I go." This newfound emotional freedom leaves her without bearings. A gorgeous voice like Garcia's would haunt any man (or woman, no judgment here!). This kind of major loss (fueled by regret and recriminations) would provoke someone like Mark Cooper of Green Room Rockers to respond with a fabulously aching cover of Etta James' "I'd Rather Go Blind" ("...than to see you walk away from me"). We'd go with this choice, too. NYC Reggae Gig Alert: Dirty Reggae Party IX w/Uzimon, Subatomic Sound System, Jammyland Band, and Milton Henry Tonight! Who: Uzimon (dancehall), Subatomic Sound System (dub), Jammyland Band featuring Honeychild (reggae), and 70s roots artist Milton Henry (plus Crazy Baldhead selectors spinning reggae, ska, dub, and dancehall). NYC Ska Gig Alert: The Toasters and Royal City Riot This Sunday! Where: East 23rd Street and the FDR Drive in Manhattan - The Jewel starts boarding at 6:00pm and leaves the dock at 7:00pm. While a three-hour tour didn't end so well for the crew of the SS Minnow, The Toasters' booze cruise should be a blast...just wear a life-preserver if you think you're gonna get out of hand. NYC Reggae Alert: Dub is a Weapon This Saturday Nite! The Promo Copy: Please come out and celebrate the birthday of Larry McDonald when Dub Is A Weapon performs alongside Giant Panda Guerilla Dub Squad on Saturday, June 11th. Special guest Rob Symeonn will be on hand to sing a few tunes with DIAW. Should be an amazing night of rootical vibrations! You can also preview Dub is a Weapon's new album Vaporized here. King Hammond is making what must be his first US appearance (apart from his alter-ego's trips here as Nick Welsh with Bad Manners) at the Iron and Ink Festival (hot rods and tattoos!) in Long Beach, CA this Saturday (6/11/11). KH will be appearing alongside The Skatalites and Fishbone on the Main Stage (click here for the full band schedule). King Hammond is also playing El Coliseo in downtown Tijuana, Mexico on Friday (6/10/11) and Brick by Brick in San Diego on Sunday night (6/12/11). 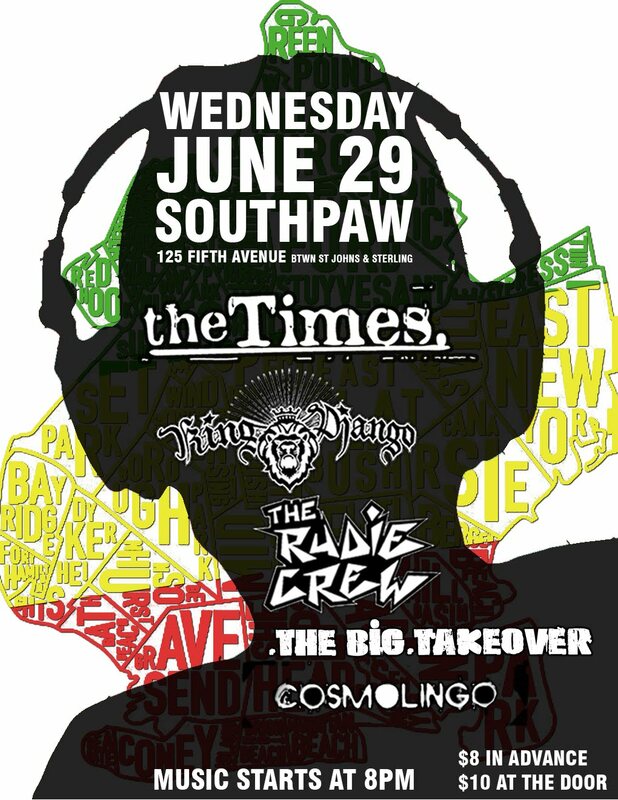 NYC Ska Gig Alert: The Hard Times Friday Nite in Brooklyn! The Promo Copy: Come down to Two Boots Brooklyn for a Friday night of great food, good friends and two boss sets of reggae, soul, samba, dub and a whole everything-pizza full of Jamaican musical mayhem. The Damage: It's free, but do buy some pizza and drinks. Duff Review: The Selecter "Big in the Body, Small in the Mind"
Pauline's and Gaps' incarnation of The Selecter has just released the new digital single "Big in the Body, Small in the Mind" (for vinyl freaks like me, a limited edition 7" single will be available July 23rd with "Back in Black" on the flip side) in advance of their forthcoming album, Made in Britain (to be released September 1st, 2011 on Vocaphone Records). This extraordinary cover of Woody Guthrie's "All You Fascists" (which may remind one of the Special AKA's powerful and uncompromising "Racist Friend" in content and tone) manages to transform a WWII-era banjo-y anti-racist/fascist folk song into an immediately identifiable and eminently catchy Selecter ska cut. Like Woody's original (which you can listen to below), Pauline and Gaps are brazenly and gleefully defiant in the face of racial/ethnic/class hatred--and they're more than happy to name the names of the enemies of multiculturalism: KKK, BNP, Tea Party, etc., as well as boneheads everywhere. Indeed, even though The Selecter drops Guthrie's bloody lyrical call to arms ("I'm going into this battle/and take my union gun"), which in Woody's day was directed against Nazi Germany and the Axis, very little content (sadly) needs updating (Guthrie's lyrics are listed below). Pauline does swap out a line about "poll tax and Jim Crow" to reflect the Dickensian economic inequality of our times: "Derivatives and hedge funds/Greed has got to go!" Amen, sister! The Selecter's choice to cover Woody Guthrie's song is a potent reminder of the great potential of language coupled with popular music to effect social change; for examples, see the fascinating book "33 Revolutions Per Minute: A History of Protest Songs, from Billie Holiday to Green Day" by Dorian Lynskey, which I'm reading now. (Seems that with all that's going on in the world we could use a bit more music with a message.) Without a doubt, The Selecter's "Big in the Body, Small in the Mind" continues 2 Tone's vitally important tradition of decrying social injustice--and beautifully celebrates Woody Guthrie's incredible musical/political legacy. The lyrics give your head food for thought; the music makes your body want to dance; and a crucially important, and still relevant, anti-racist message is broadcast far and wide. This is protest music at its best. The Selecter's "Big in the Body, Small in the Mind" can be purchased from Amazon or Amazon UK. Below is the official Selecter video for the track, along with an abridged version of Woody Guthrie's original song, "All You Fascists." 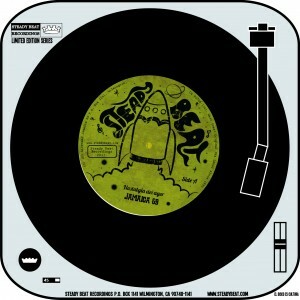 Duff Review: Jamaica 69 "Nostalgia del ayer" b/w "Una lagrima por ti"
Luis P. Correa's great Steady Beat Recordings is back on the beat (read up a bit on the label's past here) with must have 7" vinyl singles from Mexico's amazing skinhead reggae devotees Jamaica 69 and LA's vintage ska masters The Delirians (a Duff Guide to Ska write-up of The Delirians' single can be found here). Both tracks on Jamaica 69's single--covers of sixties soul tunes--are surprisingly raw and tender skinhead reggae love songs. "Nostalgia del ayer" ("Nostalgia for Yesterday") was originally recorded by The Royalettes in 1965 as "Gonna Take a Miracle" (Ken Boothe also recorded a boss rendition of it) and the Jamaica 69 version is about a friend who became a lover "that showed me love every time you shine." "Una lagrima por ti" ("A Tear for You") is a terrific early reggae reading of Brenda Holloway's 1967 Motown hit single "You've Made Me So Very Happy" (notably covered by Alton Ellis) with new lyrics about a lost love: "I will never forget the way you kiss/You made me so happy and now it is enough to mourn" (just please try to obliterate from your mind the bombastic, white bread 1969 cover by Blood, Sweat & Tears that's been a perennial staple of oldies radio and K-Tel/Time-Life collections!). 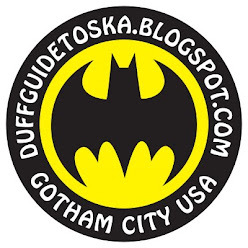 Regular Duff Guide to Ska readers know that I'm a big fan of Prince Fatty and Hollie Cook (read my reviews of their recent singles here and here). So, I've very much been looking forward to hearing Ms. Cook's debut, self-titled album--which has just been glowingly reviewed by the BBC. The BBC's David Aaron declares it to be "one of the most enjoyable reggae albums of 2011 so far." Cook's album is being released on Mr. Bongo Records in the UK on June 6, 2011 (US followers should look for copies through Ernie B's Reggae soon after).